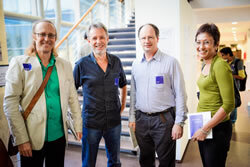 Thanks to funding from Nanyang’s CLASS conference scheme, Roger T. Dean (MARCS Institute, University of New South Wales, Australia) and Diemo Schwarz (IRCAM, France) could be invited as Keynote Speakers; they also performed in the concert that opened the symposium, and contributed to the exhibition. It is a pleasure to collaborate with eContact! in presenting a broad collection of articles emanating from this event, and to use these as a basis for an overview of sound art and related activities in Singapore. Eleven texts from the SI13 Proceedings have been edited for this issue. Joining them are two texts originally written for the catalogue of the “Sound: Latitudes and Attitudes” exhibition held at Singapore’s Institute of Contemporary Arts (7 February – 16 March 2014). Finally, in the guise of a “community report” on sound art activities in Singapore, I have contributed a “constructed multilogue” created from interviews with three sound art colleagues. Roger Dean enjoys a rich and varied career as performer, composer of electronic music and researcher in music cognition. 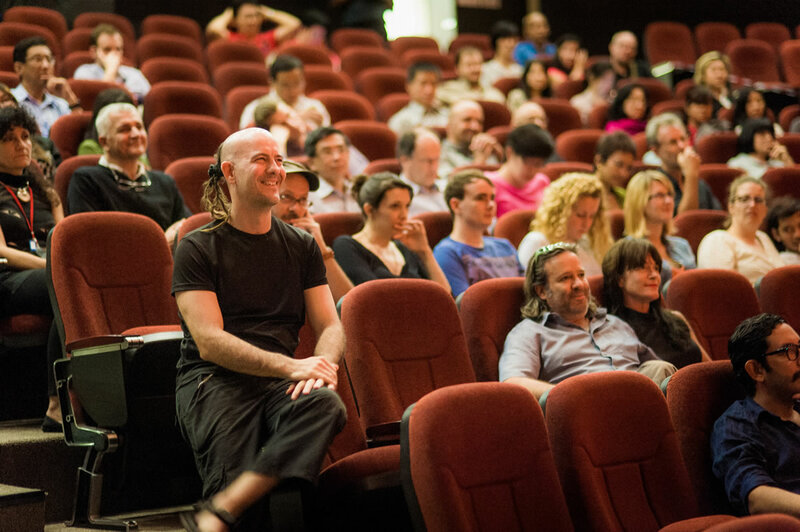 Based on his Keynote Address at SI13, “Interactive Sound” offers an overview of “Generative approaches from computation and cognitive sciences” that enable music expression, particularly the use of algorithms that take “live” input during performance, an approach that he demonstrated during the SI13 concert, in solo performance as well as in a duo with Diemo Schwarz. SI13’s second Keynote Speaker is the person behind CataRT, a Max/MSP software for corpus-based, concatenative, real-time synthesis. Diemo Schwarz describes ways to interact with the software, giving examples from numerous creative works, in “Interacting with a Corpus of Sounds.” One of his recent collaborations is with the Paris-based User Studio, developing a new type of haptic interface, DIRTI. It invites full-contact physical touch interaction, and the prototype that Schwarz brought along to the SI13 Exhibition was very popular with students and other visitors. Joleen Loh, Bani Haykal and Mark Wong were the curators of “Sound: Latitudes and Attitudes,” a landmark exhibition in Singapore. Originally written for the exhibition catalogue, Loh’s “Just Outside our Hearing” is an impassioned call for attentive listening as an act of engagement with society — a form of care. It also introduces the reader to sound artists in the Singaporean scene. Published in the same catalogue, Bani Haykal’s “Interview with Joyce Koh,” one of Singapore’s most versatile and experienced music artists, touches upon sound art and music composition, acoustic sound and electronic, as well as the development of an individual artistic voice through collaborations. In a similar spirit, PerMagnus Lindborg has constructed a “multilogue” from interviews with Pete Kellock, Zulkiflie Mahmod and Mark Wong, all three deeply invested and active participants in the Singapore sound art scene. In his Community Report, “Sound Art Singapore,” Lindborg has staged the four of them in a virtual discussion about the various forces that have shaped the local scene to what it is today: traditions and trends, individuals and institutions, æsthetics and dollars. In addition to the performances by Dean and Schwarz mentioned above, the symposium concert included works by Joyce Beetuan Koh and Steve Dixon, Luis Hernandez-Galvàn and Stefano Fasciani, as well as Renick Bell, who gave a live-coding laptop performance. “Considering Interaction in Live Coding through a Pragmatic Aesthetic Theory,” Bell applies John Dewey’s 1930s theory of intention-appraisal-evaluation to explain the performer-audience interactions in the setting of a live coding performance. This novel æsthetic approach sheds light on live coding as a method for prepared, yet improvised, performance. Bell was awarded the SI13 “Best Student Paper Travel Award” for this work. With a radically different take on the role of the computer in performance, Stefano Fasciani has worked together with Lonce Wyse on a system for voice control of synthesis. Starting with the observation that everyone has, in his or her own voice, access to an instrument capable of producing a rich spectrum of timbral nuances, they have developed a general control system. The performer’s voice and the synthesizer’s input parameters are pre-analysed, and machine-learning approaches are applied in order to create optimal dynamic mapping layers. The system is fully functional and expressive, as Fasciani also demonstrated in performance. Their contribution, “‘One at a Time by Voice’: Performing with the voice-controlled interface for digital musical instruments,” describes the parameter mapping strategy in detail. Based on machine-learning techniques, the system gives the performer expressive control of an audio synthesizer with the use of the voice alone. Voice also plays a central role in the work presented by Joyce Beetuan Koh and Steve Dixon. Their recent production of The Waste Land is a one-actor multimedia performance. 2[2. The work was officially premièred on 13 March 2014, but we were fortunate to have had a sneak preview of one act at the SI13 concert.] In their article, they discuss “The Music of T.S. Eliot’s Poetry: Integrating text, live performance, sound design and video in a multimedia theatre production of ‘The Waste Land’,” as well as strategies for composing a counterpoint of text, video, acting and soundscape. Among the items found in the exhibition was a prototype of the DIRTI interface, which Diemo Schwarz has developed in collaboration with User Studio, described in the article mentioned above. 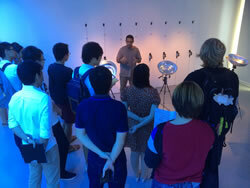 Other interactive artworks exhibited during the symposium were signed by Candice Ng and Studio|Lab and Julius Bucsis. 3[3. For more information about the pieces as well as snapshots from the exhibition, see the Sound Islands webpages.] Visitors could also listen to acousmatic compositions by Roland Cahen, Jerod Sommerfeldt, PerMagnus Lindborg and Brona Martin in the “Sofa Listening” area of the exhibition. In her article, Brona Martin explains how a series of serendipitous encounters while making field recordings led her to create a soundscape composition about Banagher, her hometown in the Irish midlands. She describes her own “Compositional approaches and inspiration using spoken word, field recordings and electroacoustic techniques” in relation to the work. Several of the papers presented at the SI13 Proceedings were further developed into the articles appearing in this issue. Based at the National Institute of Education, Eddy Chong and Qin Ding describe their work on interactive educational software for music educators to teach notation using Roman numerals. The authors argue, in “Symbolic Representation of Chords for Rule-Based Evaluation of Tonal Progressions,” that declarative rules are particularly apt for this task, as well as for training the perception of harmony in a range of Western music styles. A researcher in music technology who recently moved to Singapore, Simon Lui presents a method to predict basic emotions in speech audio from acoustic parameters in “Defining the Dominance Axis of the 3D Emotional Model for Expressive Human Audio Emotion.” This research represents the initial phase in a project aiming to create emotion-controlled game-like music applications for health and therapy. Jingyin “Jon” He (aka jprecursor) is a young Singaporean sound artist and software developer who is active in New Zealand and California. 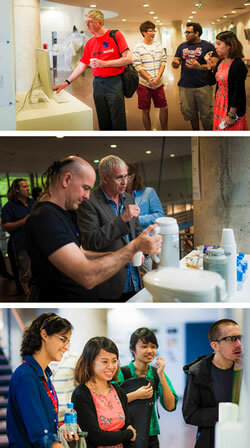 At SI13, he presented two works on behalf of a larger team of collaborators. The first, written with co-authors Jordan Hochenbaum and Ajay Kapur, “VIE, An Automata Sequencer: Performance and composition through metaphorical representation of living organisms,” describes a generative MIDI sequencer based on Conway’s Game of Life. The software is open-source and has been employed in laptop performances as well as in robotic installations. His second contribution is co-signed by Kameron Christopher, Ajay Kapur and Dale A. Carnegie. “Interactive Sound Synthesis Mediated through Computer Networks” presents an approach to interactive laptop performance in which network latency determines synthesis output. A deceptively simple impulse-feedback principle generates complex sound textures, more or less harmonious or noisy. The performers quite literally “play the network”. In tune with the topic of the latter, Christopher joined He via Internet to present the paper. In addition to the articles presented in this issue of eContact!, the Proceedings also included spoken papers on sound and food event design, sonification, visualisation, audio games and acoustic interior design, by Rachel Chen, Candice Ng, Sara Lenzi and Siddhant Yadav. Films of their presentations are available on the SI13 webpages. There you will also find introductions by SI13 Chair PerMagnus Lindborg and ADM Chair Vibeke Sorensen, as well as much more information. 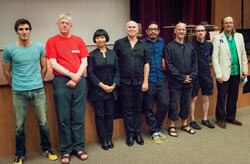 The SI13 Symposium together with other recent events in Singapore indicate the potential for strong future development of interactive music, sound art and audio research on this island. At the time of writing, plans for the next edition (SI15) are being drafted by the team. If you are interested in following this and the Singapore sound scene in general, be sure to bookmark the Sound Islands website. Stay tuned! And finally, also included in this issue are two more of a series of interviews done by Bob Gluck in 2005–06. These interviews highlight the important contributions the interviewees have made towards the development of electroacoustic milieux and programmes in the Middle East, China, South America and Europe. The founder of the Chinese Computer Music Association, Dajuin Yao, speaks of his “Multi-Faceted, Concrete Art” while the Director of the Center for Electroacoustic Music of China, Xiaofu Zhang, reflects on “The ‘Oriental Element’ in Chinese Electroacoustic Works.” An overview of their studies and experiences as young composers and of their current artistic and professional activities leads into their perspectives as composers working in the Chinese EA milieu today. I wish you an enjoyable and stimulating read!